All of the MORTAL KOMBAT D&D 5E builds on this website are made RAW using the core book and Mists of Akuma. Agimon Arena is part of one of the many character-based sidequests in Imperial Matchmaker. I knew that Mists of Akuma‘s various character options were going to at least kind of work (see the super dope Unofficial Homebrew Streetfighter D&D 5E PDF) but for the MORTAL KOMBAT crew (krew?) they performed outstandingly. I’ve gotten to use them in a few games and it’s been fun every time! But I digress–let’s talk about arena combat because that’s where these are going to be the most fun to use! 1) Use the right number of kombatants! 2) The fewer characters there are on the field the more the arena itself needs to be a character. JUMPING! Platforms suspended over acid (obviously) with different weapons on them ranging from mounted ballista to poisoned throwing spears or alchemical items. Toss some rope ladders on there so that the acid pit isn’t instant death (and then you can get a dramatic scene where someone’s working to cut the ropes!). UNIFORMS! Ceremonial armor can be loaded up with great history and plot seeds, plus it can either level the playing field or if specially cumbersome in some way change kombatant tactics. D&D 5E: Haramaki only grants a +1 bonus to AC but that’s enough to lower the armor class of a monk or barbarian with a corresponding attribute higher than +1. SotDL: Not all armor is made the same and the NPC (or PC!) gets a suit that doesn’t grant as high a bonus as the other kombatant. LESSER THREATS! As mentioned in the brilliant lyrics above a source of contractible diseases is a danger but it’s not an immediate danger–if it’s a choice between jumping into a swinging axe blade or a pile of sickness, they’re going to pick the pile of sickness. D&D 5E: Here are some diseases from Trade War. SotDL: Touching the source of infection means the kombatant must make a Strength challenge roll. On a failure, the target becomes diseased (as per the core Shadow of the Demon Lord rules). TRAPS! Buzzsaws are a personal favorite but spikes are easier (and make more sense). For extra difficulty throw in some weak, slowing-sort-of poisons that after several exposures will probably result in a failed save. D&D 5E: Being pushed against one of these spikes deals 2 (1d4) piercing damage plus poison, and falling on one deals 10 (4d4) piercing damage plus poison. A creature subjected to this poison must succeed on a Strength saving throw (DC 12 + 1 per previous save against this poison). On a failed save, the creature’s Strength and Dexterity scores are reduced by 1. The poisoned creature’s attributes are reduced until it completes a short rest or receives a lesser restoration. SotDL: Being pushed against one of these spikes deals 1d3 damage plus poison, and falling on one deals 2d6 piercing damage plus poison. A creature subjected to this poison must make Strength challenge roll (made with +1 bane per previous challenge roll against this poison). On a failure, the creature is poisoned (making all attack rolls and challenge rolls with 1 bane) until it completes a rest. THEATRICS! Remember that people are there for the show! The ebb and flow of the crowd can have an effect on the kombatants, either granting disadvantage to a d20 roll if the audience is booing or advantage for someone being cheered on by a throng of voices. In situations where bonus actions might not be getting a ton of use, consider including the option for making displays and Charisma checks to influence the crowd. D&D 5E: A kombatant can use a bonus action to make a Charisma (Performance) check (DC 20 – 1 per round of combat since this check was last made) to win the favor of the crowd. On a success, the kombatant gains a +2 bonus on ability checks and attack rolls for 3 rounds. SotDL: A kombatant can use a minor activity to make a Will challenge roll with 3 banes (-1 bane per 2 rounds of combat since this check was last made) to win the favor of the crowd. On a success, the kombatant gains 1 boon on challenge rolls and attack rolls for 3 rounds. MAGICAL EFFECTS! Pop open the planar rules and include some fun battlefield-sized effects to make mobility more interesting after the first few rounds. Lower gravity! Enhanced magic! Weaker magic! Bleeding wounds! Slippery ground! LOW GRAVITY–jump distances and jump heights are doubled, creatures have advantage on Strength checks, disadvantage on Dexterity checks, and treats all squares as difficult terrain. ENHANCED MAGIC–Treat caster level as +2 higher and when casting any spell other than the character’s highest spell slot, increase the spell’s level by +1. WEAKER MAGIC–Treat caster level as -2 lower and when casting any spell other than the character’s lowest spell slot, decrease the spell’s level by -1. BLEEDING WOUNDS–Each time a creature takes piercing or slashing damage, it gains 1 bleeding wound. At the end of the round, all creatures take 1 damage per bleeding wound. 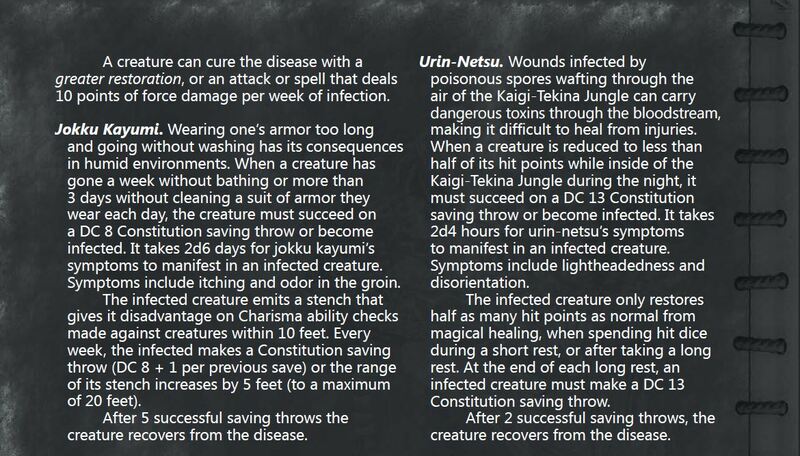 Any amount of healing mends bleeding wounds and bleeding wounds do not deal damage outside of combat. SLIPPERY GROUND–Each creature entering into a greased area must succeed on a Dexterity saving throw (DC 12 + 1 per previous save since last falling prone) or fall prone. LOW GRAVITY–jump distances and jump heights are doubled, creatures make Strength challenge rolls with 1 boon, make Dexterity challenge rolls with 1 bane, and treats all squares as difficult terrain. ENHANCED MAGIC–Characters have 1 boon on spell attack rolls and make challenge rolls to resist spells with 1 bane. WEAKER MAGIC–Characters make spell attack rolls with 1 bane and have 1 boon on challenge rolls made to resist spells. BLEEDING WOUNDS–Each time a creature takes damage from a weapon, it gains 1 bleeding wound. At the end of the round, all creatures take 1 damage per bleeding wound. Any amount of healing mends bleeding wounds and bleeding wounds do not deal damage outside of combat. SLIPPERY GROUND–Each creature entering into a greased area must succeed on an Agility challenge roll (made with +1 bane per previous challenge roll since last going prone) or be knocked prone. SURPRISE KOMBATANTS! Throw a flying predator into the mix! A pack of wolves! Pick something that will either distract people on the battlefield or be a big enough threat that they may need to team-up. 3) With one-on-one arena fights you might think that the rest of the party has nothing to do but you would be wrong! So long as they’re quiet and stealthy about it any ancillary adventurers should try to influence the fight–poisoned shards of glass thrown with true strike (and probably enchanted in some way to be able to go a considerable distance), impressively creative and incessant berating (perhaps magically increased in volume) to distract a kombatant, reflecting the sun off of a mirror to hamper someone’s eyesight. Keep these in mind if it’s looking sparse, but when the party realizes the upcoming conditions of the fight they will come up with a ton of fun ideas on their own. That’s it! Thanks for checking out MORTAL KOMBAT D&D 5E. Let me know if you get to use it, how the NPCs managed on your table, and whatever other thoughts you’ve got on the blog series!